A missing tooth can have a tremendous impact on your smile’s appearance and function. From your self-confidence to the alignment of your overall bite, the loss of your natural teeth can cause other teeth to shift out of place, not to mention embarrassment. Fortunately, dental implants offer a reliable solution. 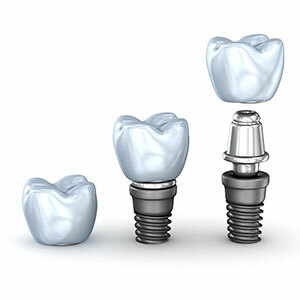 Modern dental implants are designed in a way that mimics the anatomy of a natural tooth. After it’s set into the bone near where the previous tooth was removed, osseointegration takes place and fuses the implant permanently into the mouth. Even if your missing tooth isn’t necessarily causing any embarrassment, the open space can cause other teeth to move and shift out of place. Opposing teeth may drift upward out of the gums in an attempt to find a biting partner. The sooner you choose to replace your missing tooth, the more likely you are to preserve optimal tooth alignment. Conventional treatments such as bridges call for altering the structure of adjacent teeth in order to secure the restoration in place. If you have healthy virgin teeth, this process requires unnecessary changes in otherwise healthy tooth enamel. With dental implants, you can replace a missing tooth without reshaping or compromising the integrity of other teeth in the mouth. Each implant stands independently from the next, mimicking natural teeth. As such, it maintains proper tooth alignment across the bite while preventing sunken facial tissues caused by tooth and bone loss. Dental implants aren’t for everyone. We recommend scheduling a consultation to find out if you’re a candidate or learn of alternative treatments that may be available. Book online today.